Audrey's Costume Castle & Dancewear has more than 30-years experience. 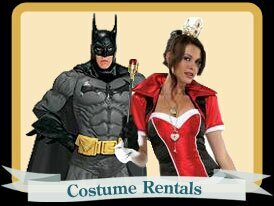 We are retail stores located in Eastern Ontario that stocks & rents costumes & accessories for any and all occasions. We combine our rental section with a huge retail section that sells costumes, make-up, hats, masks, accessories, decorations, and many other related products. Audrey's also stocks and sells dancewear, including shoes, tights, bodysuits, and dance accessories. Audrey's opened it's doors in Kingston, Ontario in March of 1984. Since then, Audrey's has continued to grow into one of Ontario's premier rental & Halloween retail outlets. With 2 stores (Kingston & Ottawa), Audrey's has been serving customers for over 30 years.